Earlier today, CBS unveiled their full 2017-2017 fall lineup, along with the first photos from their six fall shows, and two midseason programs debuting next year. During the network's upfront presentations, the first trailers for CBS' fall lineup were unveiled, which were released online after the presentation concluded. Unfortunately, the network didn't release trailers for the two mid-season shows yet, By the Book and Instinct, but the network did showcase a new trailer for the CBS All Access series Star Trek Discovery. Among the most anticipated of these CBS shows is the Big Bang Theory spin-off entitled Young Sheldon, which will have the benefit of a Big Bang Theory lead-in when it debuts Monday, September 25 at 8:30 PM ET, directly after The Big Bang Theory Season 11 premiere. However, fans will have to wait a few months for the spin-off to return, debuting in its regular time slot on Thursday, November 2 at 8:30 PM, following The Big Bang Theory. For the past few season, The Big Bang Theory has started its season on Monday nights at 8 PM, due to CBS' NFL Thursday Night Football, with the show returning to its regular Thursday 8 PM time slot after Thursday Night Football runs its course. After Young Sheldon's debut on September 25, the comedy series 9JKL will debut in the Monday 8:30 time slot, based on the life of star/creator Mark Feurstein, who moved into his childhood New York City apartment after a divorce, living between his parents (Elliot Gould and Linda Lavin) and his brother (David Walton) and sister-in-law (Liza Lapira) while he sorts his life out. Also debuting in the Monday night comedy block is Me, Myself & I, which will kick off the season in the Monday 9:30 PM time slot before shifting to the Monday 9 PM time slot on October 30, as the returning Superior Donuts takes the 9:30 slot. Me, Myself & I stars Bobby Moynihan and features the primetime network TV return of Jaleel White, who made a name for himself in the 1990s as the lovable Urkel on Family Matters. If that wasn't enough, CBS has also released the first trailer for Star Trek Discovery, which will debut this fall on CBS, before the rest of the season will air on the new streaming service CBS All Access. 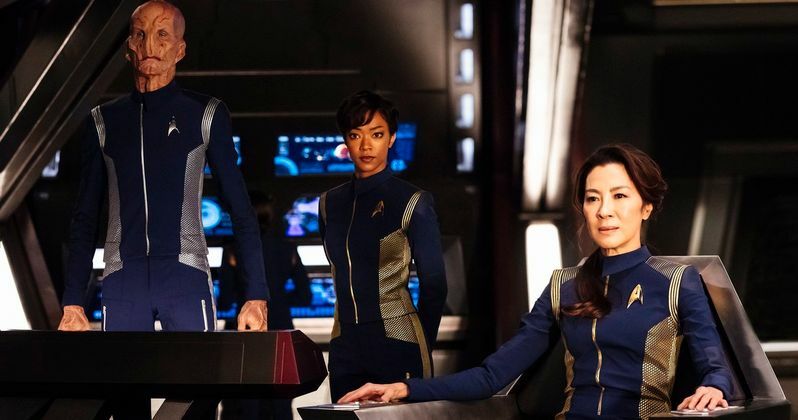 CBS also debuted a Star Trek Discovery photo today, featuring our first look at Sonequa Martin-Green as First Officer Michael Burnham and Michelle Yeoh as Captain Philippa Georgiou. CBS also announced that the first season has been expanded to 15 episodes, and that the series will be followed by an after-show dubbed Talking Trek, also on CBS All Access. Take a look at all of the new trailers for CBS' fall programs below.